Ukrainian star Leonid Bilokur collected $1,134,930 for winning the PokerStars Caribbean Adventure (PCA) $25,000 buy-in High Roller event on Paradise Island. Leonid Bilokur outlasted 140 other starters – which became 147 after seven re-entries – to secure the title after beating Team PokerStars Pro Jonathan Duhamel in their heads-up clash, leaving the Canadian with $634,550. While this is a fantastic victory for Bilokur, Quebec’s Jonathan Duhamel – the World Series of Poker (WSOP) main event champion from 2010 – has already enjoyed an extremely profitable PCA, having won the $5,000 buy-in No-Limit 8-Max side event for $239,830 after finishing fourth behind winner Sweden’s Viktor ‘Isildur1’ Blom in the $100,000 buy-in Super High Roller tournament for $313,600. This latest runner-up spot means the 24-year-old has collected an astounding $1,187,980 from three tournaments in the Atlantis Resort and Casino – all after being badly beaten when robbers, including former girlfriend Bianca Rojas-Latraverse, entered his Quebec home on December 21. It has certainly been a great start to 2012 for the Canadian – and he will no doubt be aiming to continue his splendid run of results at the Aussie Millions, which started late last week in Melbourne. Third place in the High Roller went to American Isaac Haxton, who exited with $380,730 in his pocket, while another States star, Jason Koon, finished in fourth for $271,950. Chile’s Nicolas Fierro ($217,560) took fifth, Dutchman Govert Metaal secured $181,300 for his sixth place finish, Americans Michael Telker ($145,040) and Randy ‘nanonoko’ Lew ($108,780) – a Team PokerStars Online member – filled spots seven and eight respectively, a second Chilean in Nick Yunis ($79,770) exited in ninth, and Norwegian Terje Augdal ($79,770) finished 10th. Starting the last day’s play fourth in chips, meanwhile, Bilokur, showed great patience during the early stages to steer clear of trouble as the final table began to lose challengers for the top prize. 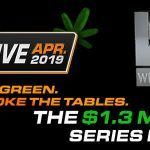 Lew was the short stack at the final table and, although he doubled-up twice, the Californian was the first player to hit the rail from the final eight. The Sacramento-based pro – who won $484,617 for taking down the HK$30,000 No-Limit Hold’em main event at the Asian Pacific Poker Tour (APPT) Macau last November – was in the cut-off seat when he found A♠ K♣ and watched as Santiago’s Fierro and then Las Vegas-based Koon re-raised. Lew could find no luck as Koon, with A♦ A♥, swiftly called the five-bet all-in from his fellow American. Lew was still in it, however, after the 8♠ followed on from a flop of Q♥ 7♠ 4♠ to hand him a flush draw, but the river of 2c ended his event in eighth place. Telker struggled to find any good hole cards, but eventually shoved all-in against the forceful Fierro. With K♥ Q♥, small blind Telker shoved, and was called by Fierro, who showed 10♠ 10♣. A flop of J♠ 10♦ 8♠ arrived to give Fierro trip 10s, but also handed Telker straight possibilities. However, the 6♠ on the turn and 6♦ on the flop did for Telker as Fierro completed a full house. Gravenhage’s Govert Metaal (The Netherlands), who finished fifth in last year’s staging of this event, exited in sixth when his A♦ 2♦ was met by the K♥ K♦ of Fierro and failed to improve. We had now reached the dinner break with Bilokur holding a good chip lead following his success against Koon in another pot. That duo had been the largest stacks at the final table until Bilokur’s win when the Ukrainian, in the big blind, four-bet his stack while holding J♠ J♣ against the A♠ K♥ of Koon. Koon called and the flop read Q♥ 5♦ 2♣ to change very little. The 4♦ and 10♠ on the turn and river ensured that Bilokur went into the break as chip lead. Fierro exited in fifth place not long after the five remaining players returned from their meals, when his pocket twos could not improve against the 10s of Haxton. Fourth place went to Koon shortly afterwards. His five-bet shove while holding A♥ 4♥ into the K♣ K♥ of Duhamel was poorly timed and did not improve sufficiently for him to survive. Haxton, of Vegas, just failed to make the final two when going all-in with K♦ Q♦ against Duhamel. The Canadian called with A♣ J♠ and those hole cards held as the board revealed 9♥ 6♦ 4♥ 6♥ 9♦. So that left us with Duhamel and Bilokur with the former holding a 5,430,000 to 1,960,000 chip lead as heads-up play began. However, even though Bilokur was well behind, he fought back to overcome this big chip deficit to take the title and top prize after what was a disappointingly – and somewhat surprisingly – one-sided affair. The last hand of the High Roller event arrived when Duhamel moved all-in with K♦ 4♥, to be met by Bilokur’s A♦ 7♣. The flop of A♠ J♠ 9♦ pretty well ended Duhamel’s hopes of victory – and this was confirmed when the J♥ on the turn left him drawing dead. 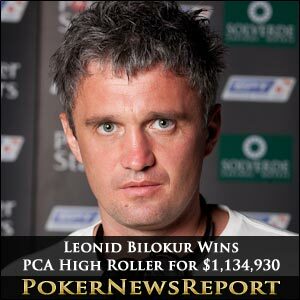 As if to solidify Bilokur’s victory, the A♣ arrived on the river to give the Ukrainian a full house and the title. Meanwhile, Canadian Matt Marafioti and American Eli Berg collected $72,520 each for finishing in 11th and 12th respectively, while another Canadian, Leonid Vichman, left with $65,270 for securing 13th place. Japanese star Kunimaro Kojo also picked up $65,270 for finishing in 14th – to add to the $92,540 he had already collected from winning the PCA $5,000 buy-in No-Limit Hold’em Eight Max Turbo event. American venture capitalist Bill Perkins left in 15th, while New York’s Elio Fox – the €10,000 buy-in No-Limit Hold’em main event from last October’s WOSP Europe in Cannes – hit the rail in 16th as both players received $58,020.